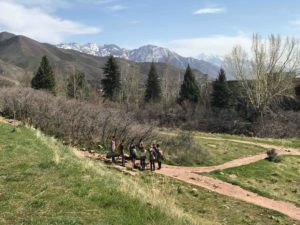 The compressed version: In Spring 2018, a graduate course studying “Tectonic Essays” set out to explore unmapped sites, hidden histories, and aesthetic ecologies in their backyard of the University of Utah. Grounded in field-based practice, students adopted sites to repeatedly return to cultivate the art of attention and to consider interconnections with places farther afield. Tectonic etymologically derives from Greek (τεκτονικός) “pertaining to building,” as in “builder” or “carpenter,” while essay derives from French (essai) in the sense of “assay” or “test.” In environmental writing, different languages and disciplines converge and collide like tectonic plates, leaving rubble of different rhetorics to grow a renewed ecosystem. What are the possibilities and limitations of this seismic metaphor for writing? What products emerge from this process? How might our close engagements with sites suggest new sightlines for consideration? As our brains evolve through reading and writing in the digital age, how do we cultivate care for the material world, for each other, and for different embodied knowledges—not only of humans but of the many beings with whom we live interdependently?